Although an official Woodstock 2009 is still uncertain, there are plenty of other Woodstock celebrations happening this summer 2009. For more information information, check out the Woodstock 40th Anniversary page. San Francisco’s West Fest is gearing up to be the premier celebration for the 40th Anniversary of Woodstock. Best of all, it’s a free concert and is scheduled for October 25th at Golden Gate Park. To learn more about this fabulous event organized by Boots Hughston of 2b1 Multimedia in association with Artie Kornfeld, one of the original producers of Woodstock 1969, check out their latest press release for info on performers, featured artists, and special events. Recent developments have indicated that Woodstock Ventures may decide to collaborate with Przystanek, the Polish equivalent to Woodstock. Although still in the works, the concert in Prospect Park that Lang had initially planned is off to a sluggish start due to the faltering economy. Lang has expressed interest in Przystanek as a possible European installment of Woodstock 2009 to replace the concert at Tempelhof Airport in Berlin. It is OFFICIAL. 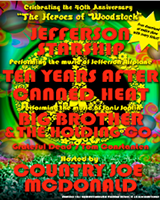 Tom Constanten, Mountain, Jefferson Starship, Ten Years After, Canned Heat, Melanie, Big Brother and the Holding Company, Levon Helm Band, and Country Joe McDonald will play the Bethel Woods Music Festival on August 15 2009, as well as 14 other shows across the USA. Read The Heroes of Woodstock May 21 Press Release. It has been reported that Woodstock 1969 producer Michael Lang has scrapped his plans for a Woodstock 2009 on the dates of the original festival. The hope is still a concert in Prospect Park, but no official plans have been submitted to the New York City Parks Department at this time. Sponsorship for the gargantuan event has been challenging in a slow economy, making the hopes for an August festival look bleak. Lang is instead hoping to “pull something off” in September to celebrate the Woodstock 40th anniversary. Learn more about Woodstock 2009 in NYC. The Father of Woodstock Artie Kornfeld has announced that his official celebration of the Woodstock 40th Anniversary will be at West Fest in San Francisco’s Golden Gate Park on October 25, 2009. Read on about Artie Kornfield Says Yes To West Fest. The book is titled The Pied Piper and will describe the life of Artie Kornfeld and his place in American music culture. The co-creator of Woodstock 1969 is responsible for much more than promoting the largest music festival in history. Read more about the new Artie Kornfeld Book. Kornfeld currently hosts the Spirit of Woodstock Nation, a talk radio show on the ArtistFirst Radio Network every Tuesday at 10pm EST. Although the possibility of an official Woodstock 2009 looks grim, it aims to return to the roots of what made such an impact on music and American culture. The latest information is that co-creator Michael Lang had planned two Woodstock 2009 concerts, and is still in the process of looking for sponsors and the process seems to be moving slowly. Whether or not the spirit of Woodstock 1969 is physically manifested this year is yet to be seen. However, the goal of the original organizers is to return to the ideals of the Woodstock nation. Do not be fooled, the spirit of Woodstock 1969 is very much alive, and there are plenty of events to celebrate the Woodstock 40th anniversary. They may not be of the Woodstock brand, but finding music, art, and ideas surrounding the original festival will not be a daunting task. Woodstock Story aims to bring you the latest information not only on Woodstock 2009, but also other events that capture the spirit of Woodstock 1969. Woodstock 2009, Still a Long Shot? Organizers of Woodstock 1969 have been eyeballing Prospect Park in New York as the site for a Woodstock 40th anniversary show. Reports indicate that the originally planned concerts are still possible, but the dates could be pushed back to late September. Michael Lang had been hoping to hold two free concerts, but is still stuck in the process of finding sponsors due to the faltering economy. It appears as though Woodstock 2009 will miss its originally targeted dates of August 15th-18th of 2009. Lang has yet to book any bands and claims that a September concert remains “a long shot” and he hopes to “pull something off”. Although the ideas for the Woodstock 2009 festivals are relatively concrete in the minds of organizers, the number of interesting sponsors simply is not enough to fund the extraordinary endeavor at present time. The estimated cost of an official Woodstock 2009 concert is around $8-$10 million, and no official plans for the concert have been submitted to the New York City Parks Department. Lang also reported that a 40th anniversary celebration of Woodstock 1969 may be broadcast exclusively over the Internet. The digital Woodstock 2009 would be separate from any planned live concerts such as the Prospect Park installment. Woodstock Story will keep you posted on updates on this story, but it appears that all hope is not lost for a Woodstock 2009.